In retrospect, I often wonder why it is “sheep stealing” to invite someone to another protestant church, but luring people away from the Catholic Church is encouraged. I always felt like something was missing there, but I didn’t know what was missing. I had been born and raised Catholic, but I was so poorly catechized that I had no idea that I was missing the Eucharist, the true presence of Christ. 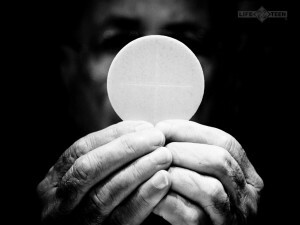 I didn’t realize what Catholics believe about the Eucharist, and I was raised IN THE CHURCH. It wasn’t until I was reading an article in a free copy of Catholic Answers magazine that I came across the fact that the Church teaches that Christ is truly present, body, blood, soul and divinity in the Eucharist. It was an “aha” moment for me. Next I listened to Scott Hahn’s testimony about his conversion to the faith. I read Rome Sweet Home. I listened to more talks by Scott Hahn about reading the New Testament in light of the Old Testament. It was really only through the testimony of this Biblical scholar that I returned to the Church. I am divorced and remarried. My first marriage was annulled, but my current husband’s first marriage was not. I am outside the fullness of Grace. This tears at my heart. I long for Christ in the Eucharist and for the graces of the Sacraments in which I cannot participate. I pray for my husband’s heart to change and I wait. Everything in God’s time, though. My heart breaks for friends who have left the church because they, like I, were poorly catechized. They do not have the understanding of the truths the Church teaches to return. They have been changed by the time they have spent listening to protestant friends and protestant preachers who twist what the church is and does. Perhaps they have read a few too many Jack Chick tracts. I try to direct them back to the Church, but I am not a very good apologist, despite knowing which scripture verses support what the Church teaches. I am afraid I am even less of an evangelist, so I pray. I pray that they will turn their hearts towards Christ’s words in the gospels and that they will listen with their hearts to His call. I know when I turned my heart toward Him, I came home. I try to live the Corporal Works of Mercy in my life. I have been in both Catholic and protestant churches when there was no one there. The protestant churches were empty and FELT empty. While no other human person was in the Catholic Church with me, it never felt empty. I always felt and feel His presence there. I came home despite my exclusion from the sacraments because He is there. I offer to Him my imperfection and brokenness and pray that He will use me despite my flaws. I thank Him for His love and mercy. I continue to teach my children and attend Mass and to be an imperfect party of the Body of Christ. I also loved Scott Hahn’s writings as they gave me so much more depth to what I learned in RCIA. My heart goes out to you and I will keep you in my prayers that one day you will be able to fully participate in the sacraments and receive Christ in the Eucharist. My husband is a fallen away Catholic and I pray that he will one day return Home too. One thing I know for sure is that God has a plan and one day it will be revealed in His time. Even though you feel like you are not good at apologetics or evangelizing, I believe that your participation at Mass is a great testimony to others knowing that you are doing it because you know it is the true and right thing to do. Dear Marie. I am deeply touched by your testimony. I have remained Catholic all my life, but I know that many times in my life journey, I have turned away from God and just like the prodigal son, I return to Him when I realize my sinfulness. No one is a perfect member of the Body of Christ. We are all imperfect. I am sorry that you are unable to partake of the Holy Eucharist and I pray that God will make a way so that you can again receive Him in Holy Communion. God bless you. The man you are with IS NOT YOUR HUSBAND(without nullity). Listen to Jesus. I am divorced and defended our marriage against both the State and the Church. Again my wife is trying to nullify it but, this time, I refuse to play that game. I was there. I am not senile, nor do I see with ROSE COLORED glasses. of your blog is scandalous to people like myself who live alone after we have lost everything and been abandoned, except by a few. I AM NOT judging your soul. That is God’s place, alone. I am siimply giving you my take, if my understanding of of your circumstances is accurate. Otherwise, sincerely, may God be merciful towards you and lead you where HE wants you. Sometimes, the road is not easy. But, it beats HELL, hands down.